I know this book is beloved by many but I. JUST. COULDN’T. I’m not exactly sure why. It was an audiobook so I listened to it while doing other things like driving, ironing kid’s uniforms, cleaning the house etc. I tried to hang in there but once I discovered that the MC had a crush on her brother and kissed him, it was all down hill from there. I kind of felt that the author (or her editors) were trying to make the book more interesting/scandalous than it really was gross me out. No matter how hard I tried – and I did – I couldn’t get past this aspect to the story. I didn’t connect with a single character. I had no empathy for them and didn’t find any interesting. Well, maybe except for the girl who learned her rich daddy really wasn’t her daddy. That must have been tough. I have the utmost respect for creativity and recognize it’s not easy to create something liked by everyone, but I thank goodness loads of others love this book enough whereby my solitary inability to stand it (strong, I know), won’t matter. 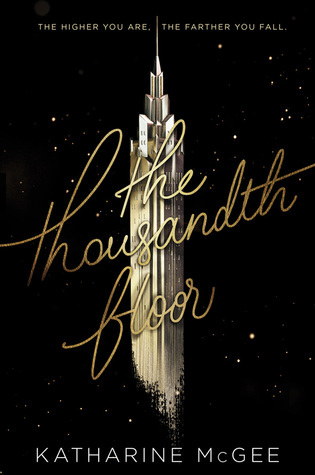 Yup, those were my thoughts on The Thousandth Floor. Next postLooking for a cover artist? LOL. This review was hilarious. And agreed, this book was awful. I only got past the first three chapters. I tossed it in the trash after that. Gosh, I’m so glad I’m not the only one, lol! I hate it when I can’t finish a book. I almost take it like a personal failure. Honestly, its weird thing I do. I always force myself to read practically every book I start. This one, however, just didn’t work for me. Thanks so much for stopping by and chiming in! Ha! Same here. It kills me not to finish a book. Nice to virtually meet you! Hilarious! I know how hard it is to not finish a book. I’ve been trying to read Wicked since it came out in hard cover. What’s wrong with me? A few chapters in and I keep giving up. Thanks for the post. Thanks so much for stopping by! Signed up to your mailing list after reading a few of your posts, btw. Continued success! Yeah, and Wicked is a good book (I’m told.) Oh well. Thanks for checking out my blog too!